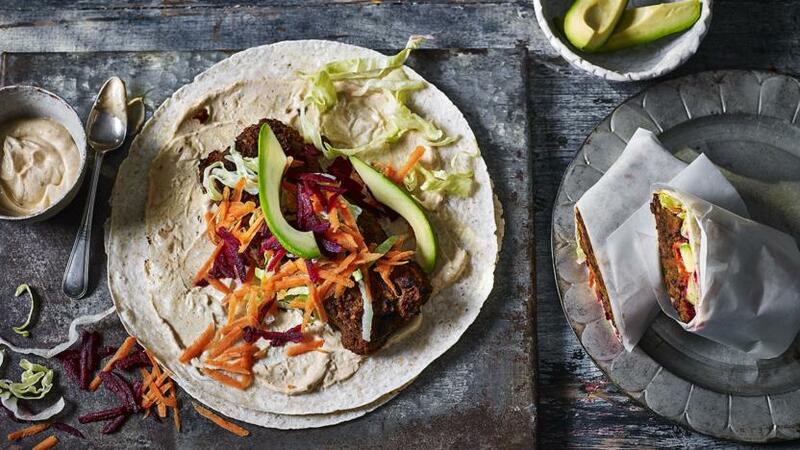 Choose a non-dairy alternative to Greek-style yoghurt for a vegan version of these delicious burritos. Each serving provides 685 kcal, 25g protein, 101g carbohydrates (of which 21g sugars), 22g fat (of which 5g saturates), 26g fibre and 1.5 salt. Prick the sweet potatoes all over with a fork and put on a small baking tray. Bake for 50–60 minutes, or until soft all the way through. Remove from the oven and allow to cool. Turn off the oven. Scoop out the flesh from the sweet potatoes into a large bowl. Put half of the black beans into a food processor with the walnuts and blend until smooth. Add to the sweet potato flesh, with the remaining black beans, paprika, dried herb mix, garlic powder and onion powder. Season with salt and pepper and mix well. Line a baking tray with baking parchment. Divide the mixture into four portions and shape into logs, about 15 x 7 x 2cm/6 x 2¾ x ¾in on the lined tray. Flatten them slightly and chill in the fridge to firm up for 2 hours. Heat the oven again to 200C/180C Fan/Gas 6. Cook the sweet potato patties on the middle shelf of the oven for 50 minutes. Meanwhile, mix the chipotle paste and yoghurt together in a bowl. When the patties are cooked, place the tortillas in the oven for one minute until warm, but still pliable. Spread each tortilla with a big spoonful of the chipotle yoghurt and place a sweet potato patty in the middle. Top with lettuce, carrot and beetroot. Slice an avocado quarter in half and lay both pieces on top, then roll the tortilla around the filling tightly. Slice in half and serve.